Officials confirmed the crash that took place this morning. 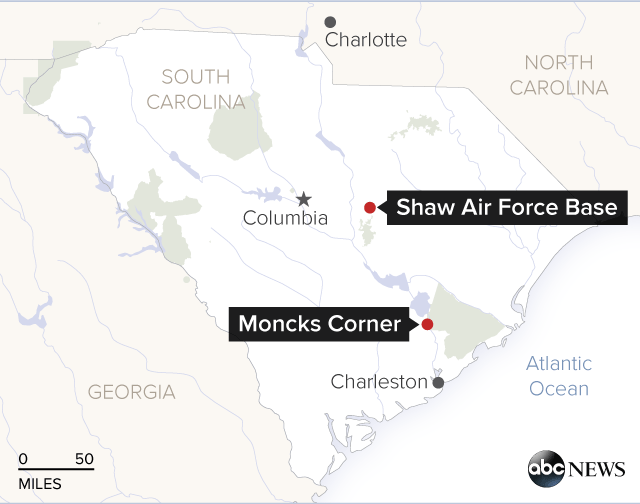 Two people died when a military fighter crashed into a Cessna plane today midair about 11 miles north of Charleston, South Carolina, according to the Federal Aviation Administration and the National Transportation Safety Board. The NTSB confirmed this afternoon that the two people on board the Cessna C150 died in the 11:06 a.m. crash with the F-16 fighter. The identities of the pilot and the passenger who were killed in the two-seater plane have not been released. "We have no reason to believe that anyone survived the crash, other than the military pilot," Berkeley County Coroner Bill Salisbury, who is working with the more than 20 state and federal agencies involved in the search, said at a press conference this afternoon. "We are in a recovery mode and not a rescue mode now," he said. An Air Force spokesman confirmed to ABC News that the pilot of the F-16, identified as Maj. Aaron Johnson, ejected from the plane and is now being evaluated at Joint Base Charleston's medical clinic. The plane and pilot came from Shaw Air Force Base, roughly 100 miles north west of Charleston. NTSB investigating this morning's mid-air collision between an F-16 military aircraft and a Cessna 150 in Moncks Corner, SC. Col. Stephen Jost, who is the head of the 20th Fighter Wing at Shaw Air Force Base, said that Johnson was headed to Charleston and was in regular contact with air traffic controllers throughout the flight. The records of the calls and the data from the flight has not yet been examined, but Jost said that it would "indicate that he was talking to air traffic control as they normally do." "There are a hundred factors that could have been at play here," Jost said. The Cessna was likely en route to Myrtle Beach, Jost said. Capt. Robert McCullough, of the South Carolina Department of Natural Resources, said divers from his agency had been looking for the bodies in the Cooper River. The F-16 crashed about 5 miles away, according to McCullough. The Air Force also said that a "team of investigators will convene to determine the cause of the accident. No further information is available at this time."